Joe Calloway's Becoming a Category of One redefined competition with its lessons on how to truly differentiate yourself in a marketplace of sameness. In this revised and updated Second Edition, Calloway rethinks, repositions, and reenergizes that message. 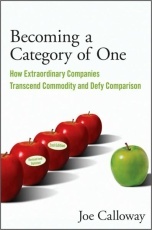 A new chapter on "tiebreakers" provides lessons on differentiation from companies like Zappos, Apple Computer, Netflix, Café du Monde, Hyundai, and In-N-Out Burger. Calloway also includes cutting-edge ideas on the Category of One company of the future from an extraordinary list of guest contributors, including bestselling authors Larry Winget (It's Called Work for a Reason!) and Mark Sanborn (The Fred Factor), Gen-Y expert Jake Greene, Pinnacle Financial Partners CEO Terry Turner, business strategists Randy Pennington and John Spence, branding expert Jack Sims, corporate consultant Chuck Feltz, customer service gurus Scott McKain and John Dijulius, sales and marketing expert Sue Remes, and motivational legend Jim Cathcart.